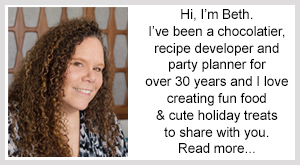 October 28, 2015 By This post may contain affiliate links. You don’t need magical powers to make these Nutella Fudge Witch Hats. 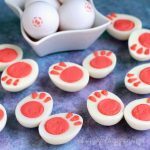 These sweet little Halloween treats are simple to make using just a few ingredients. 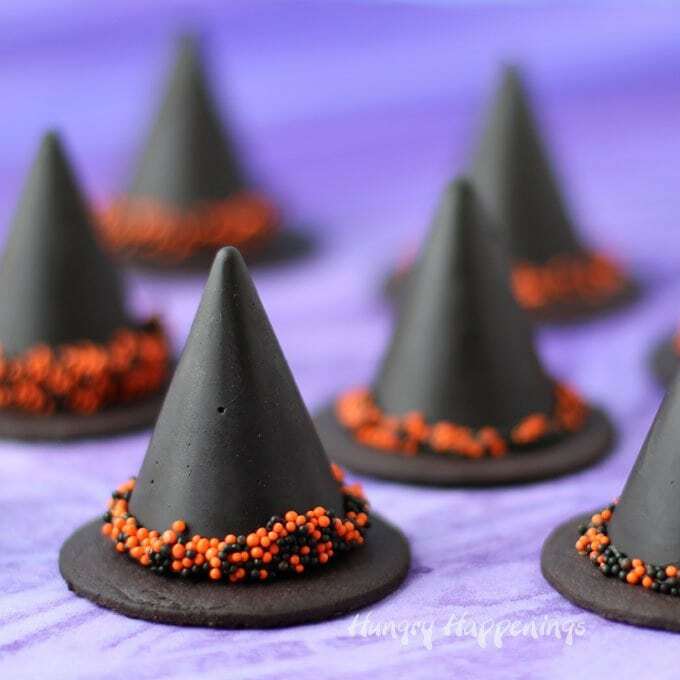 Nutella blended with black candy melts makes a rich and creamy fudge that’s used to create the tops of these witch hats. Each fudge cone is decorated with orange and black nonpareils and is then attached to a chocolate cookie. To get the perfect shaped cone for these hat’s you’ll need a Wilton Petite Treat Cone Silicone Mold. The fudge, is liquid when warm, so it’s easy to pipe into the mold, but once frozen will set firm, so you can easily get the cones out of the mold. Then as the fudge thaws it becomes soft and creamy. To make the cones, you will pour the warm fudge into a pastry bag then pipe it into the mini cone silicone mold. Once you’ve filled 20 cones, you’ll pop the mold into the freezer for about 20 minutes so that the fudge hardens. Remove the mold from the freezer and un-mold the candy by turning the mold upside down and pressing on the mold, pushing the candy out. Allow the fudge cones to sit at room temperature for at least 30 minutes before decorating. You can either use store bought chocolate cookies or homemade. 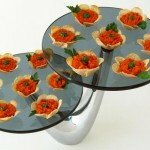 You’ll want them to be about 3 inches in diameter. 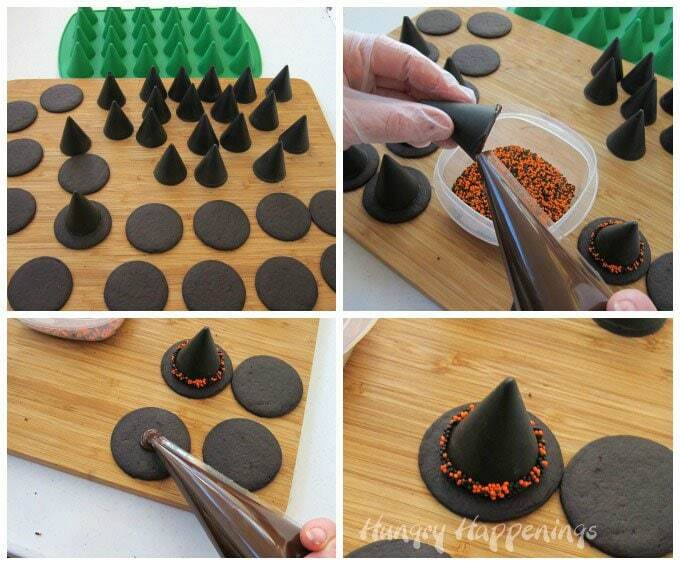 To decorate the hats, pipe some candy melts around the bottom edge of a fudge cone and dip in some orange and black nonpareils. Pipe a small dab of candy melts in the center of a chocolate cookie and set the decorated fudge cone on top. 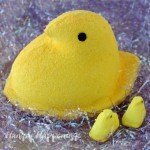 Allow the candy melts to dry. 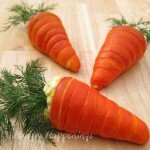 Store these Halloween treats in an airtight container for up to a few weeks. Decadently rich Nutella fudge cones decorated like witch hats for Halloween. Heat the Candy Melts on high in the microwave for 30 seconds, then stir. Heat for 30 more seconds, then let the bowl sit in the microwave for 2 minutes, then stir. Heat for another 30 seconds and stir. If needed heat for 10-15 second increments, stirring after each, until melted. Stir in the Nutella until smooth. Pour into a pastry bag. Pipe into the cone shaped cavities in silicone mold. Freeze for 20-30 minutes until firm. Allow fudge cones to warm to room temperature. Heat remaining candy melts in microwave on high for 10-15 second increments, stirring after each, until melted. Pipe a bead of candy melts around the bottom edge of a cone. 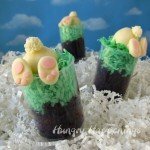 Attach the fudge cones to a cookie using a dab of candy melts. 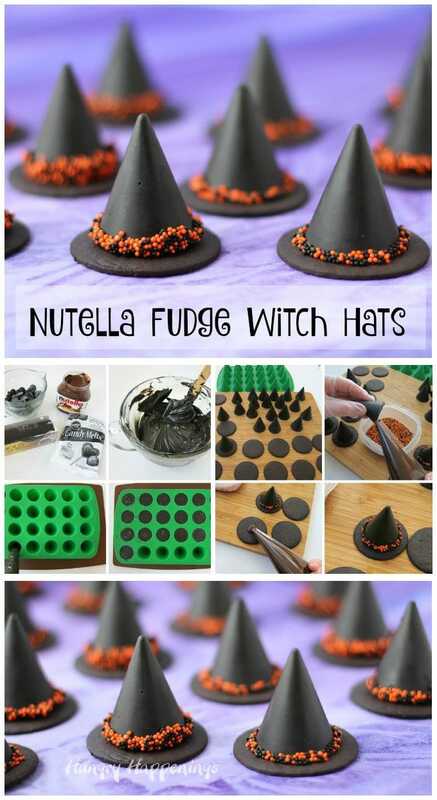 Click this link to see more fun Halloween recipes like these Nutella Witch Hats. You may not believe I have never tried nutella, yes, I’m probably the only one on the planet who hasn’t. But now that you’ve mixed it with chocolate, how can I resist? Sounds so yummy and just a wee bit wicked! What, What??? 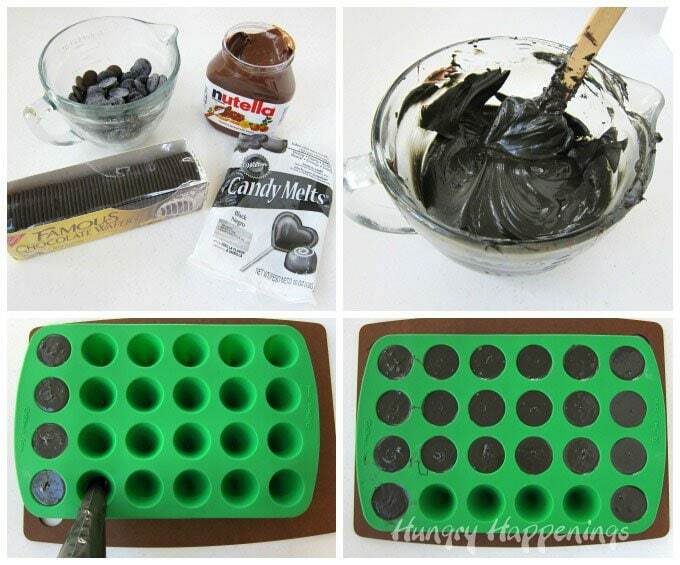 You totally need to give Nutella a try. 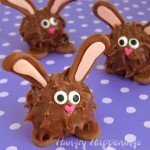 The fudge is yummy and so easy to make.